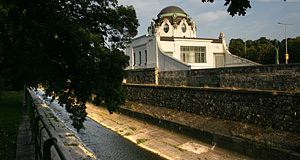 The Wien is a creek in Vienna, its sources can be found in the Wienerwald or Vienna Woods, at Mount Kaiserbründl near the town of Rekawinkel, to be precise. The Wien enters the Donaukanal and ultimately the Danube at the Urania star observatory near the Ringstraße in central Vienna. When I first heard the term "Wiental", which means "Wien Creek Valley" I pictured a Romantic river landscape like one sees in a Constable painting - in fact, the "Wiental" is a "gorge" that runs mostly between apartment blocks and concrete landscapes in central Vienna. The Wien looks back to a career as a movie star, featuring as a sewer in "The Third Man". What millions believed to be the stinking sewage was actually mostly rain- and spring water from the Vienna Woods. The Wien is 34 kilometres long and carries water from an area of 230 square kilometres - which is a lot for a relatively small creek. The amount of water that runs down the Wien can vary within a few minutes: The surroundings of the river are heavily populated and do not take up a lot of moisture after rain falls; the same thing applies for the Wienerwald, because of the kind of soil there - thus, most water rapidly runs straight into the Wien. Since the covered parts of the Wien are popular with bums and drug addicts, unexpected rainfalls have killed many people in the past. Half of the Wien runs through the federal province of Lower Austria, the other half through Vienna. So why this article? A creek is surely no big attraction of Vienna, is it? The Wien is, for several reasons: Firstly, it has played an important role in the Third Man, as described above, and tourists can still do "Third Man" tours that take people to the underground shooting locations of the movie, including some sewers and the Wien. Secondly, several important attractions of Vienna can be found on or along the Wien - beginning from the entry point: The Palace of Schloss Schönbrunn, at the covered parts the Otto Wagner Häuser on the Naschmarkt, the Theater an der Wien, the Naschmarkt market itself, the Secession, the Verkehrsbüro, the Karlsplatz, the Karlskirche, the Wiener Musikverein and Künstlerhaus, the Schwarzenbergplatz, the Akademisches Gymnasium, the Stadtpark where the Wien enters the surface again, the Museum für Angewandte Kunst MAK, the Kriegsministerium and finally the Urania. Not to forget the Art Nouveau or Jugendstil pavilions and train stops that Otto Wagner built for the Stadtbahn, which is now the U4 subway line. Thirdly, the Wien is a lifeline of Vienna and the city has "evolved" around this creek, similar to the Gürtel Road, the Ringstraße, the Danube and the Donaukanal. The Wien is the natural border between several districts - on the left side of the Wien, you find Penzing, Fünfhaus, Mariahilf and Innere Stadt; on the right side of the Wien, you find Hietzing, Meidling, Margareten, Wieden and Landstraße. The Wien also plays a major role as a traffic route: The Subway line U4 follows the course of the creek and many major roads run in parallel to it. Thus, the course of the Wien is very obvious on maps of Vienna. Continue with "Wiental Valley - Part II"